This map of the region around NASA's Mars Exploration Rover Opportunity shows the relative locations of several craters and the rover in May 2010, when Opportunity took images for a super-resolution view of the horizon to the rover's southeast (PIA13197). The base map here is a mosaic of images from the Context Camera on NASA's Mars Reconnaissance Orbiter. The scale bar is 5 kilometers (3.1 miles). 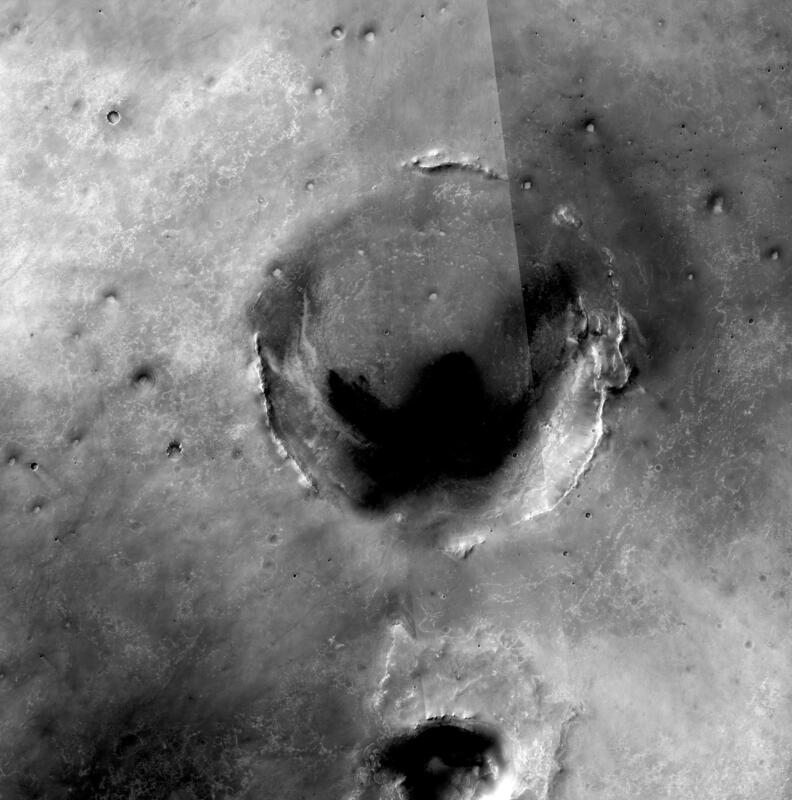 Opportunity explored Endurance Crater, near the upper-left corner of this map, during the first year after the rover's January 2004 arrival on Mars for a mission originally scheduled to last for three months. Since the summer of 2008, when Opportunity finished two years of studying Victoria Crater, the rover's long-term destination has been the much larger Endeavour Crater. The route chosen for the journey veers south of the shortest path between the two craters in order to avoid hazardously large ripples of sand. 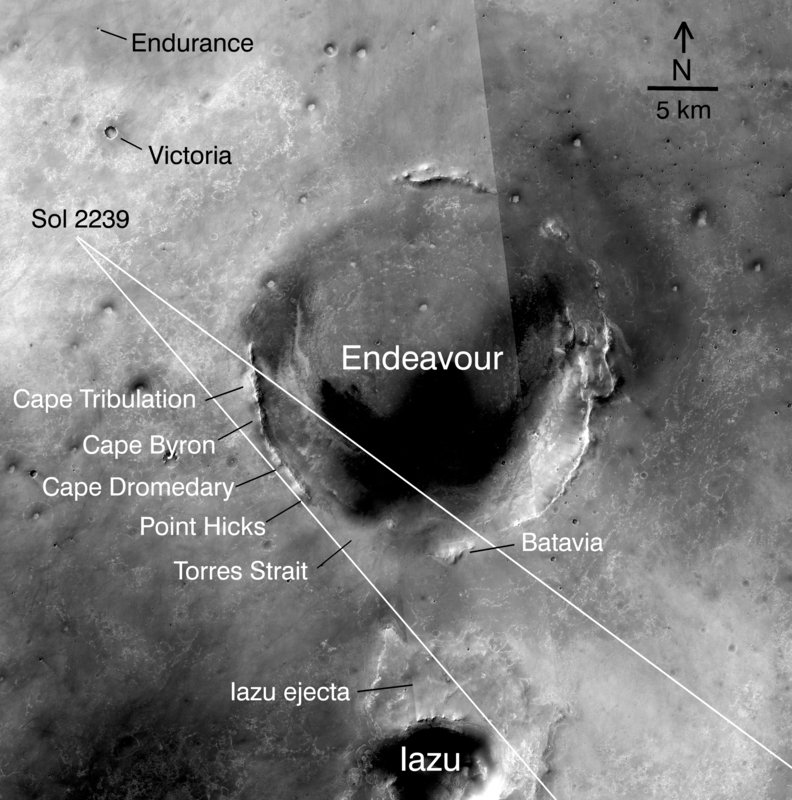 By the spring of 2010, Opportunity had covered more than a third of the charted, 19-kilometer (12-mile) route from Victoria to Endeavour and reached an area with a gradual, southward slope offering a view of a portion of Endeavour's elevated rim. On this map, the southeastward lines originating from the point labeled "Sol 2239" show the angle covered in the super-resolution view generated from a set of images that Opportunity's panoramic camera (Pancam) took during the 2,239th Martian day, or sol, of Opportunity's mission on Mars (May 12, 2010). The points labeled "Cape Tribulation," "Cape Byron," "Cape Dromedary" and "Point Hicks" on this map are also visible in that Sol 2239 Pancam view, as correlated by rover science team member Tim Parker, of NASA's Jet Propulsion Laboratory. The science team has assigned those and other informal names for features at Endeavour Crater using as a theme names of places visited by British Royal Navy Capt. James Cook in his 1769-1771 Pacific voyage in command of H.M.S. Endeavour. The Pancam view also shows some of the thick deposit of material ejected by the impact that excavated Iazu Crater, south of Endeavour. 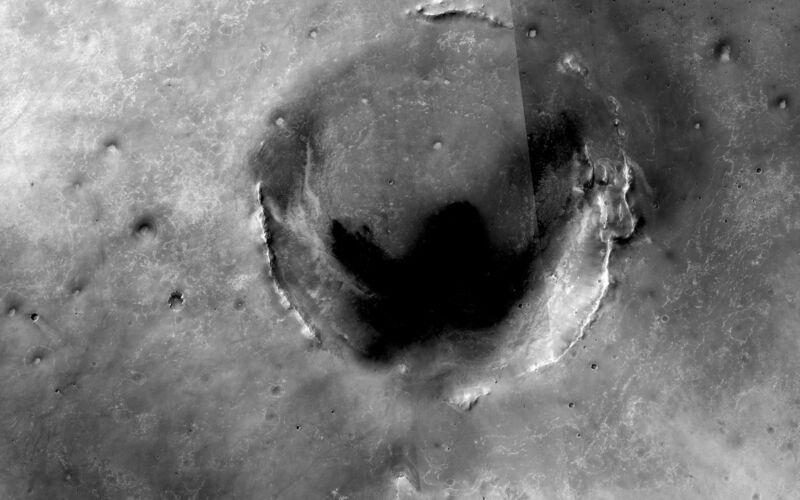 The observed increase in brightness of Iazu's ejecta relative to Endeavour's features is consistent with modeling by science team members Mike Wolff, of the Space Science Institute, and Ray Arvidson,of Washington University in St. Louis, applying optical characteristics Opportunity has measured in the Martian atmosphere. 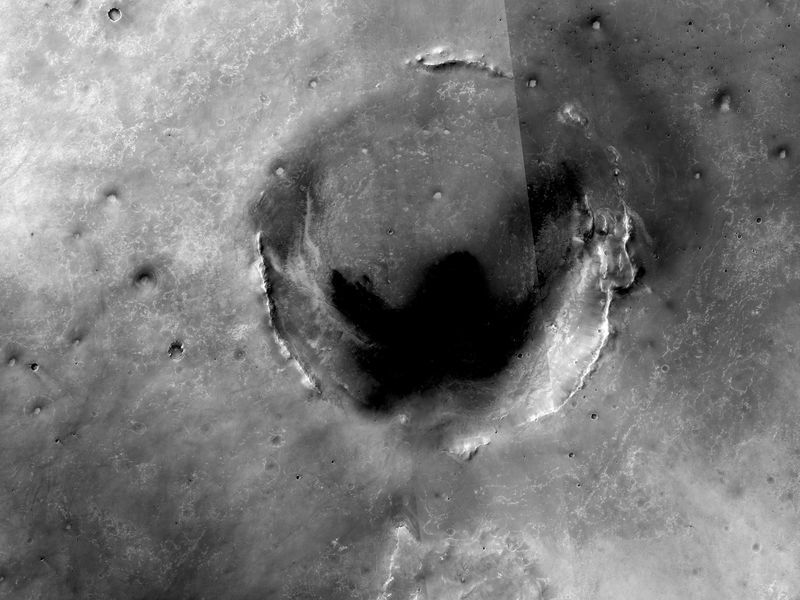 After the rover team chose Endeavour as a long-term destination, the goal became even more alluring when observations with the Compact Reconnaissance Imaging Spectrometer for Mars, also on the Mars Reconnaissance Orbiter, found clay minerals exposed at Endeavour. James Wray, of Cornell University, and co-authors reported observations of those minerals in Geophysical Research Letters in 2009. Clay minerals, which form under wet and relatively neutral pH conditions, have been found extensively on Mars from orbit but have not been examined on the surface. Additional observations with that spectrometer are helping the rover team choose which part of Endeavour's rim to visit first with Opportunity.